When you set up a Wi-Fi network, whether using access points (base stations) from Apple or another vendor, you’re usually playing a guessing game. Where should I put a base station to get the best coverage and performance? Or multiple base stations? Apple provides some tools to help, including the somewhat hidden Wi-Fi Diagnostics program (buried in /System/Library/CoreServices/), but using them requires some expertise, as well as keeping your eye on ever-changing signal-strength numbers. 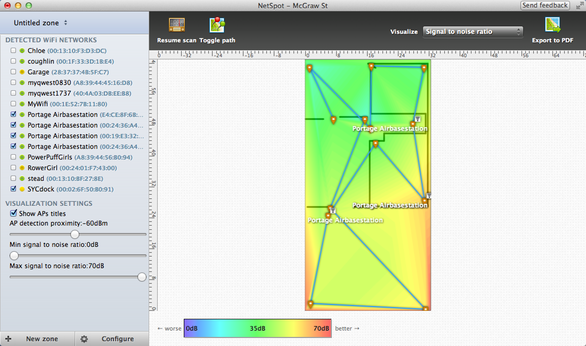 NetSpot bypasses the technical in favor of the visual. This free site-survey software is a remarkable aid in laying out even a small-home network, using a Mac laptop as your survey tool. You start with a map of a single floor, which you either draw using a few primitive graphics tools or load as an image file which is used as the background. You give the map a scale in meters or feet by marking the distance between two known points. Finally, you mark the region of the map that represents the area you’re going to scan. With the map ready, you simply walk the area with your laptop. At any position, clicking the corresponding location on the map tells NetSpot to perform an on-the-spot scan of any and all Wi-Fi signals it can find. You can mark as many spots as you want—the more you mark, the better your results, especially in a house or office that has dead areas due to a poor network layout, or thick walls, furniture, or appliances that block Wi-Fi signals. I tested by mapping most corners and doorways. When you click the Stop Scan button, NetSpot draws a color-spectrum heat map in which the indigo end of the spectrum represents the weakest (or no) signal-to-noise ratio (SNR, the measure of how much information may be carried, a rough gauge of throughput), and the red end represents the strongest. This is a bit confusing, as a typical user might think of green as best, yellow as moderate, and red as worst. A scale at the bottom of the finished map at least helps you calibrate your head. A NetSpot heatmap shows the best, worst, and mediocre areas of wireless coverage, along with base station locations. By default, NetSpot shows the entire range of measurable signal for the signal and noise visualizations, but you can choose a higher minimum and/or a lower maximum. For example, if you want to ensure that you have at least a certain SNR (which essentially means that the network can operate at or above your desired minimum speed), you could set that SNR as the minimum; anything below that minimum simply won’t appear on NetSpot’s map. Figuring out such a threshold, however, is beyond the scope of this review. NetSpot could improve on this feature by adding bandwidth tests that would allow some educated guesses about the typical range of Wi-Fi speeds at a given spot. The map also identifies the rough position of each base station. I was stunned by how well it performed this task in my home. I have three base stations, one on our main floor, and the other two at opposite ends of the basement; while walking the main floor, NetSpot placed the basement and upstairs AirPort routers within a foot of their actual positions by triangulating signal-strength measurements. If an estimated placement is incorrect, NetSpot offers a slider for adjusting the signal threshold at which an access point is thought to be detected. However, pushing the value higher may cause some access points to disappear—to avoid that, drop a pin during your survey phase as physically close to each base station as possible. (Unfortunately, you can’t manually designate, on the map, the precise location of a base station.) Click any base station on the map to get detailed information about it and its offerings. Click a base station to see information about it. 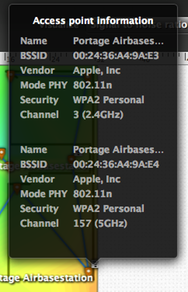 NetSpot’s map initially displays only signal information for base stations on the network to which your Mac is currently connected (assuming you’re connected to one), as well for the base stations of nearby open networks. But the utility gathers information for every other router it finds, as well, and you can choose precisely what’s displayed. NetSpot is able to track separately the 2.4GHz and 5GHz networks created by simultaneous dual-band routers, such as 2009 and later AirPort Extreme and Time Capsule models. The Detected Wi-Fi Networks list on the left side of the main window lets you choose whether or not each router’s readings are integrated into your map. A Configure pop-up menu below that list allows you to choose routers by channel, which can be helpful in choosing an unused Wi-Fi spectrum if you’re in a crowded network environment, such as in an urban apartment or condo. If you have multiple networks of your own, or have access to multiple nearby networks—some people live above a Starbucks—you can see how these networks fare individually or together. You can also click any point on the map and get a list of all the selected base stations and their corresponding visualization data (such as the SNR or quantity of base stations at that point), interpolated from the points at which you took scans. You can toggle individual base stations in a multiple-unit network to get a sense of how well each base station covers the map. If you have areas of poor reception, this information can be used to show where you might move a router to improve coverage (and then, of course, follow up with a new bit of NetSpot testing). You can also determine whether you need to add a base station. Each kind of visualization can be exported as a PDF that you can print out or carry around on your various digital devices. Base stations checked in the detected list are included in a chart, as well as on the colorized map. My old house has lathe-and-plaster walls, thick joists, and basement storage that block Wi-Fi signals. Using NetSpot, I confirmed that my aforementioned three base stations (which are connected by ethernet) are set up in locations that are close to optimal. But it also helped me discover why a laptop upstairs always connected to a base station downstairs: The laptop is used directly above one of the basement base stations, and despite the floor and ceiling in between, that base station provides the strongest signal of any of the three access points. NetSpot’s developers told me that this free version is their first attempt at building Mac OS X wireless site-survey software. A free version will always be available, but they plan to eventually release a paid version with more, and more-advanced, features. That’s good news. NetSpot is already an easy tool to use and master for one-time surveys of modest setups. Those with more significant deployments, or networks that are set up and torn down regularly, will surely benefit from whatever the developers can add to this nifty toolkit.